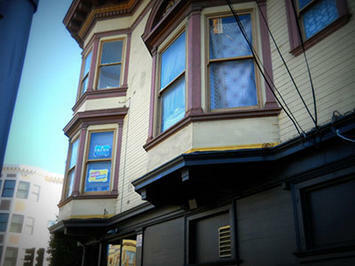 This is my old apartment in SF’s Mission District from way back when Mrs. UpintheValley and I were just dating. My waystation before cohabitation and matrimony. I notice the curtains haven’t changed. Flea market bedspreads and pillowcases were the order of the day then, and apparently still are. Which means P. has kept the lease on the place and presumably lived in uninterrupted squalor with a revolving cast of characters from Roommate Finders all these years. At the prices we were paying then, why would you ever leave? 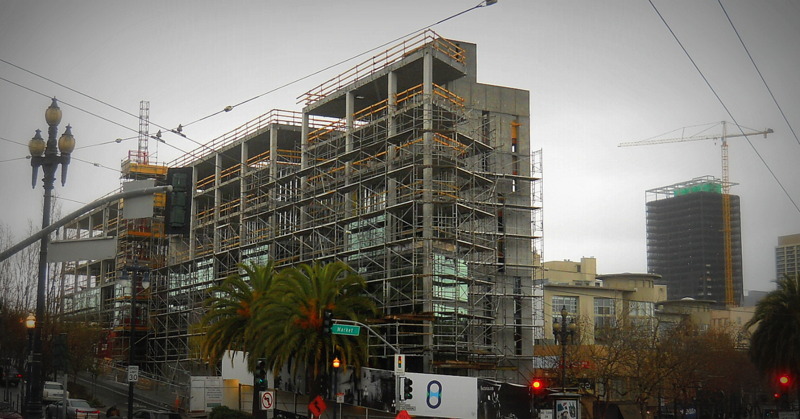 The rest of the neighborhood has…evolved, beginning with the ground floor. Man, has it ever. 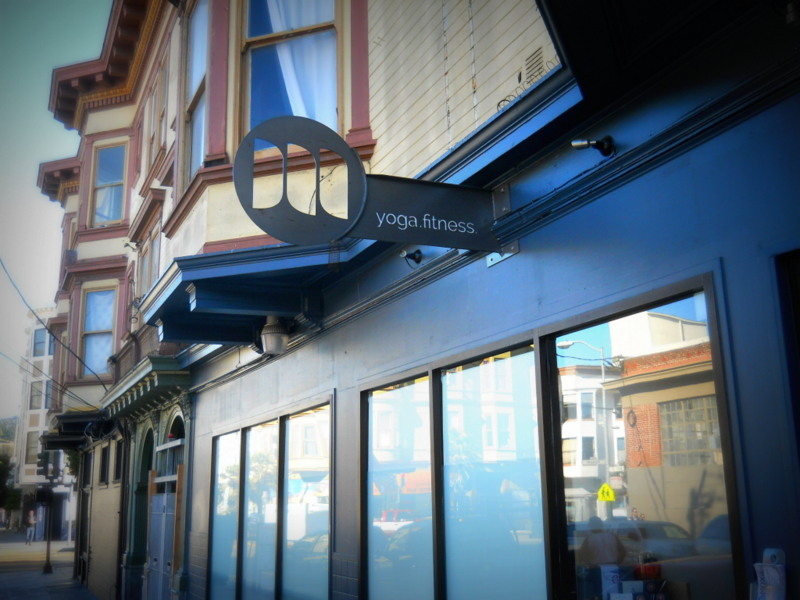 …and is buttressed by a vegan restaurant. 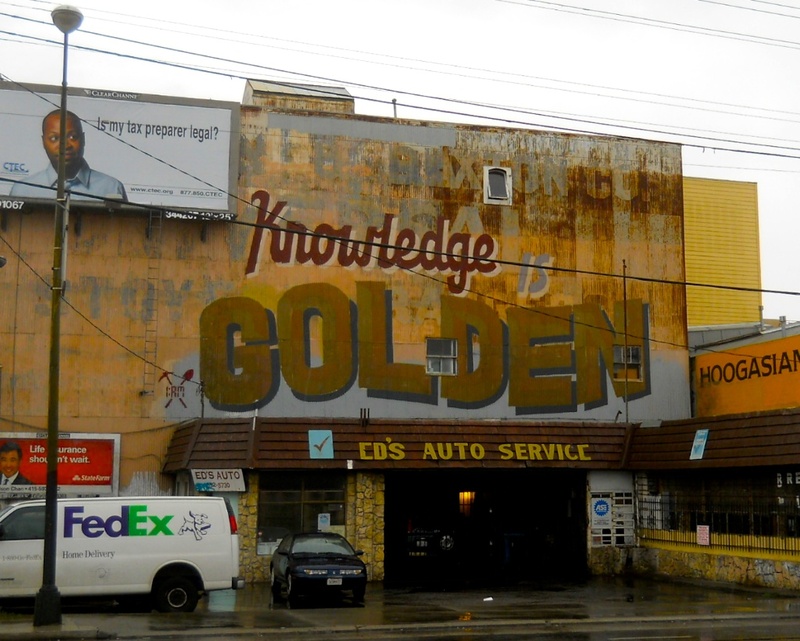 The corner liquor store beneath my old bedroom is now a supper club with gilt lettering in the window. The dive bar at the other corner, where day laborers used to drink their wages beneath the deathly pallor of fluorescent tube lighting and stagger out to the alley to relieve themselves against the wall, is now a pretentious cocktail lounge with velvet curtains. 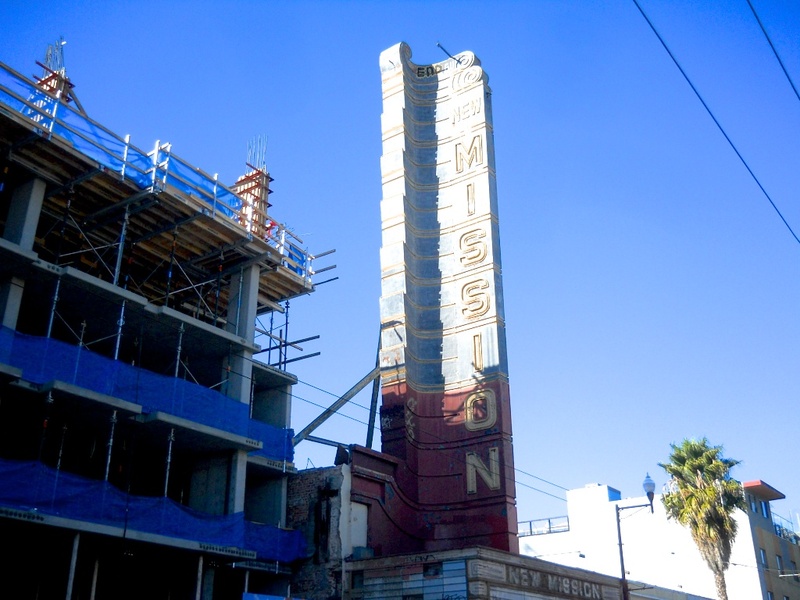 The New Mission: High end condos where the old $1 dollar movie palace used to be, but the marquee remains to satisfy the historic preservationists. 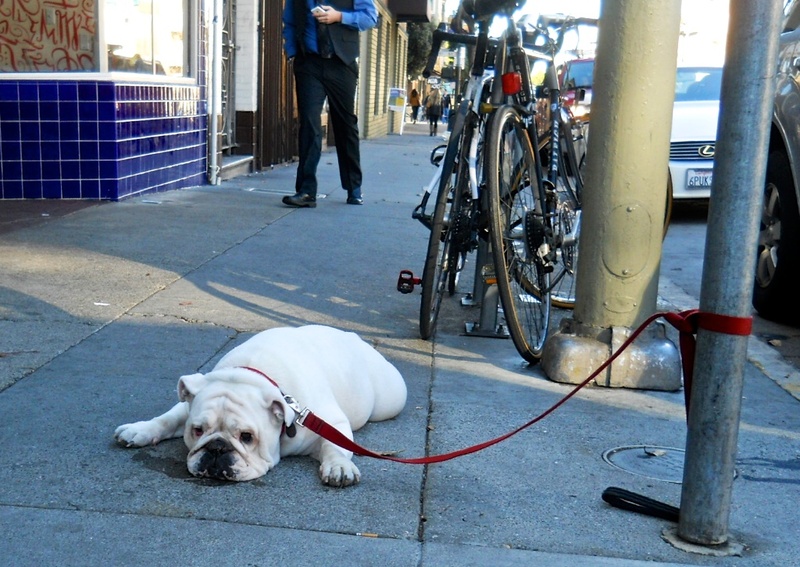 Dogs and bikes are ubiquitous in the new SF. 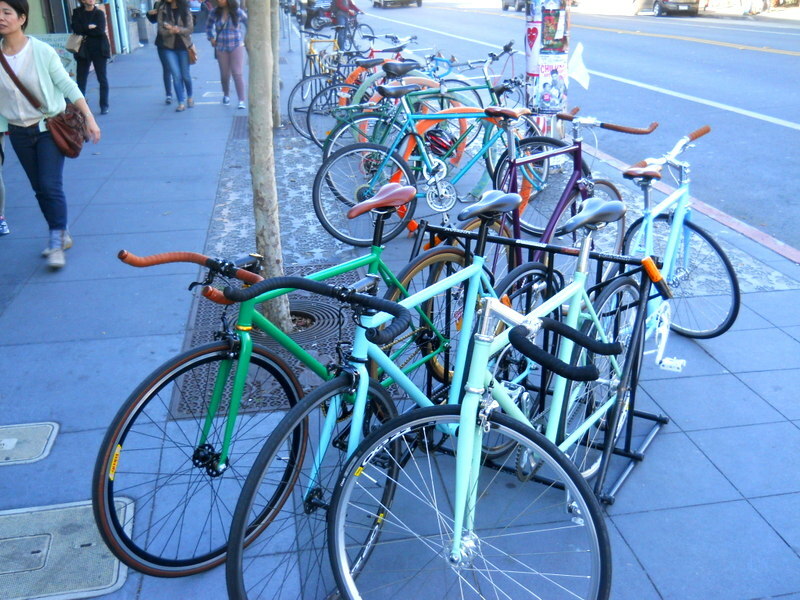 Unlike LA, the bike is king in the new social arrangement. Bike lanes are everywhere. Bicyclists are entitled to use the full lane if they choose, and they do so. You may not squeeze them to the side as you pass. There are reasons for this. One of them is: people who write programming code like to ride bikes, and the people who write code are making it rain in San Francisco. 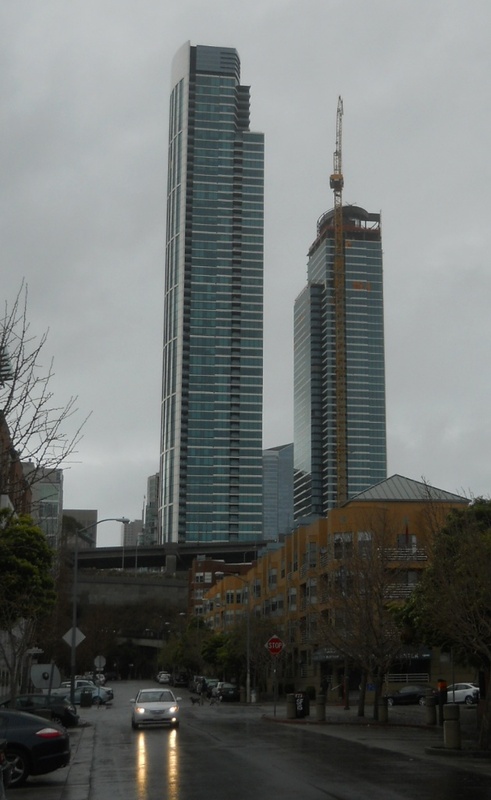 They’ve just built the two tallest apartment buildings on the West Coast. Way out in the Avenues, 3BR starter homes sell for $1 million+ sight unseen, all cash, to Chinese investors, the other group making it rain. No one in the neighborhood seems to know who the buyers are, but everything goes in multiple offers. 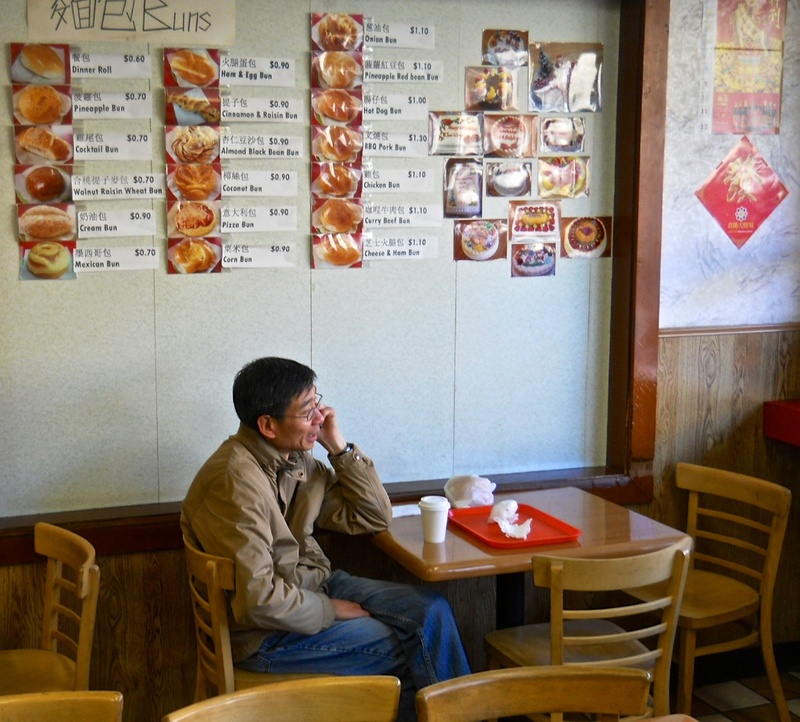 You see a guy like this at a cake shop on Taraval, yakking away in Mandarin, and you find yourself inordinately interested in someone else’s mundane conversation. I’ll say this for the Asians: not a spec of trash or tagging to be found West of Twin Peaks and I only saw one house in disrepair in three days of strenuous walking. 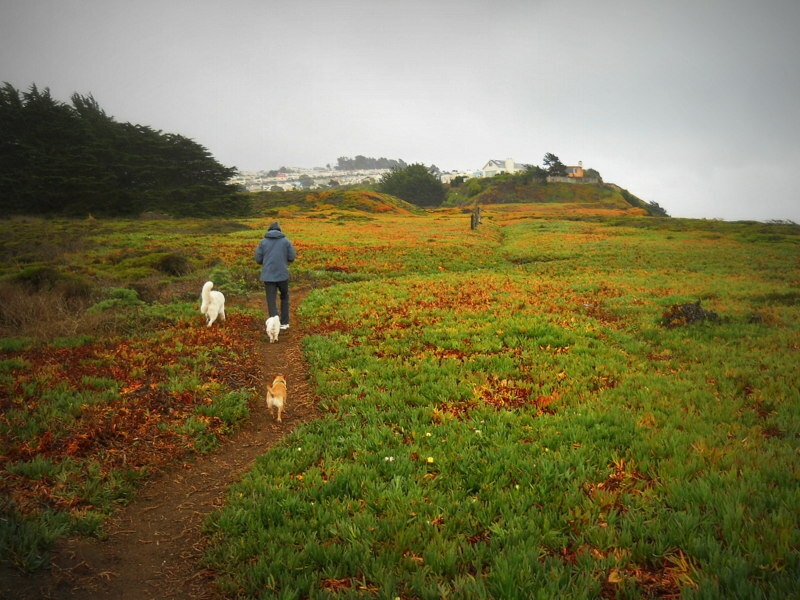 Trails, trails, trails, everywhere…with plenty of parking. 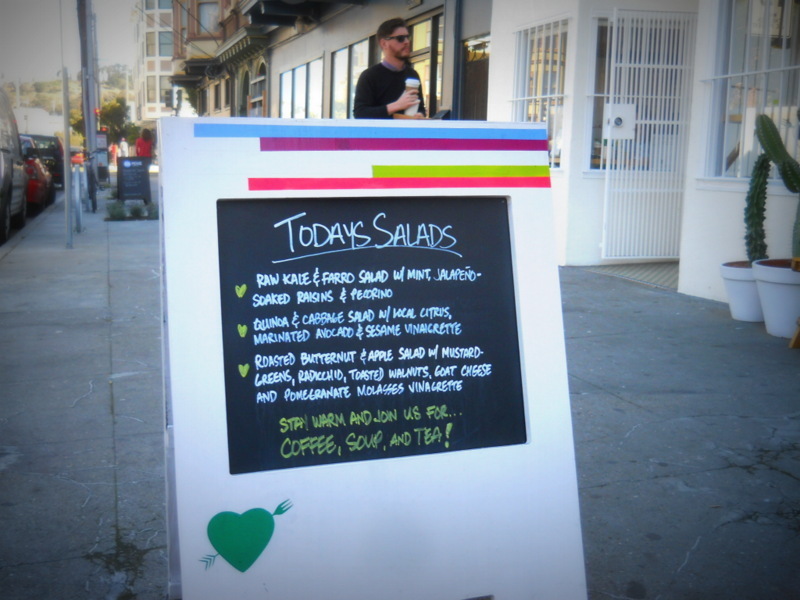 For a city drowning in New Money, San Francisco, unlike LA, has managed to retain at least one bedrock principle of the social contract. But back to the Mission. One still encounters the old army of derelicts and panhandlers, but you just don’t find as many Latinos there anymore. Its identity as a landing place for working class immigrants to get a toehold in the economy is rapidly being eclipsed by the brute facts of New Money. If people of the Twitterverse are willing to spend a million dollars to share a block with schizophrenic crack addicts then there is a diminished geography remaining for line cooks and seamstresses to occupy. Or drywall installers. Or yoga instructors. Or maintenance men. 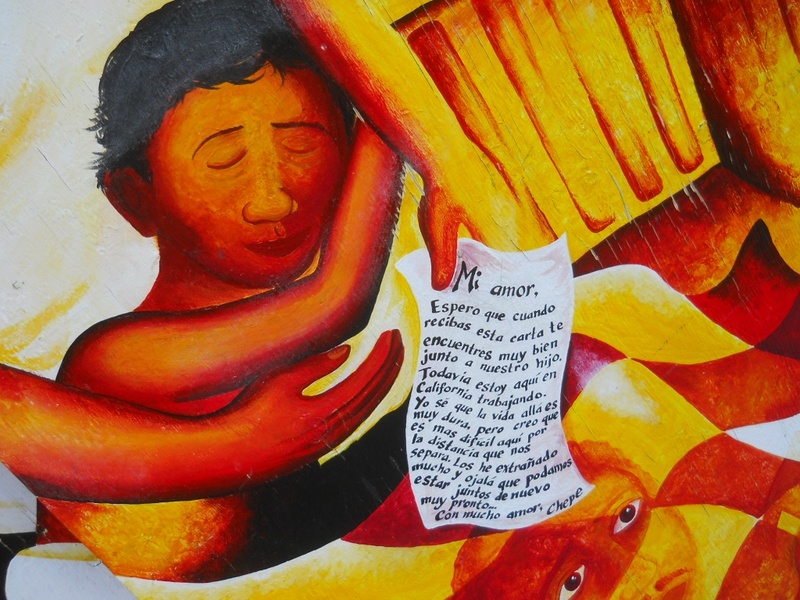 The Latino working class is abundant in Van Nuys. 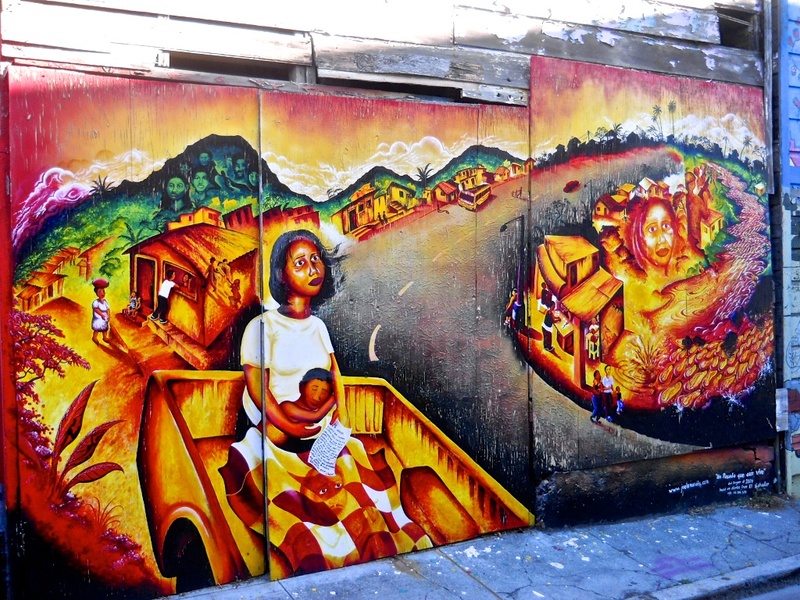 In San Francisco, it is memorialized in murals. Last image on the way out of town….a concise acknowledgement of the obvious: the laptop has replaced the pickaxe in the digital Gold Rush. Unlike their 19th century counterparts, the gold miners are actually making the money. The dry goods dealers and shopkeepers work for them. How long can this last? What happens when Apple stops selling 400, 000 iPhones a day? Social media and gaming and on-line retail are built on code. Code can be written anywhere. Angry Birds was designed in Finland. Tell me how this movie ends. Andreas Samson lives and works in Van Nuys and blogs about the San Fernando Valley at upinthevalley.org. Submitted by jamesshaffer on Fri, 07/18/2014 - 09:14. Ah, nostalgy. I know how it feels to walk the streets where you've spent some time of your life. I'm going to order a custom research paper on how nostalgy influences the coping strategies of people who move to a new place.